This is the first edition of The Wailing Wind, published in 2002 by Harper Collins. 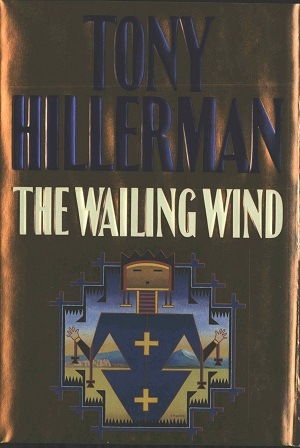 The dust jacket was designed by Peter Thorpe, who has designed and illustrated over 40 Hillerman editions and whose work has become the iconic imagery associated with Hillerman's novels. The design features a sandpainting figure in front of a mountain landscape scene. Format: Hardback, 23.5 x 15.5 cm. Binding: Mustard yellow boards with a blue cloth spine. The title, authors name and publisher are lettered in gold.